Kodak Lands Gas Generator is dead. Judith Hayes (centre) gets ready to host the residents’ meeting. Mount Dennis Residents’ Association held an information meeting last night at the York Civic Centre. Several speakers were in attendance as well as Provincial Citizenship and Immigration Minister Laura Albanese and Toronto Councillors Frances Nunziata and Frank Di Giorgio. Also of note, in the audience was a small contingent of attentive young people from the For Youth Initiative. The meeting was held to discuss the 18MW natural gas generator proposed by Metrolinx to be used in power outages on the new Eglinton Crosstown Line as well as a cheaper source of energy during peak periods. For the first part of the meeting, several speakers discussed greener methods of power generation and conservation. Once the floor was opened to residents’ questions, the most pertinent comment came in response MDCA’s Rick Ciccarelli. 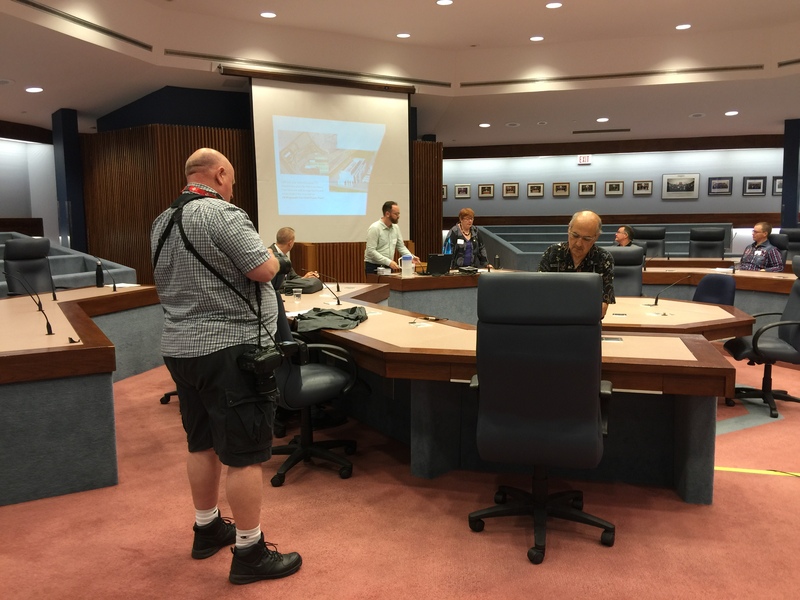 He asked the City’s Fernando Carou (Community Energy Planning) for confirmation that Metrolinx has withdrawn its site plan application for a gas generator on the Kodak Lands. He then asked what is now being planned. Carou replied that the application has indeed been withdrawn and that Metrolinx and Toronto Hydro are currently working on more environmentally acceptable ways of providing back-up power. According to the politicians present at the meeting, a further announcement will be forthcoming in about a month and that residents will be consulted on any further proposals. Interestingly, one of the speakers, Jason Rioux, Vice President of NRSTOR, confirmed that battery storage is capable of providing emergency power and that instead of using one site, several smaller battery modules could be installed along the crosstown line. This would provide more efficiency during a power outage and would eliminate the need for a large building on the Kodak lands site. The batteries would be charged at night with cheap electricity while trains weren’t running. For now, residents can breathe a sigh of relief. The generator is off the table. Well done to all involved who applied political pressure to ensure this option was eliminated and to the politicians who responded to the people’s wishes. It remains to be seen what Metrolinx will come up with next but according to the politicians present, people will be consulted on any new proposals. A further announcement will be forthcoming in about a month. Wow. This is great news! Excellent! This is wonderful. Good work on the very clear analysis of the problems, and on the alternative solutions. Next Next post: CultureShock needs you!